Rock Hill might be escaping the worst of the arctic blast that’s freezing out much of the rest of the nation, but there’s still a lot of winter left. That means cold and flu season will be sticking around for a little longer as well. Here at Rock Hill Coca-Cola Bottling Company, we want you to be warm and well this winter, so we’re passing along a recipe touted to be effective when battling the sniffles. Even if it doesn’t do much to alleviate your congestion and runny nose, it’s still a warm and soothing alternative to feeling lousy all day. 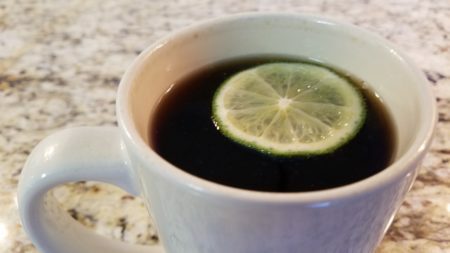 So the next time you feel run down, or the next time the temperatures plummet, curl up with a cup of Hot Coke with Lime and Ginger. Wash and dry the lime and ginger. Slice the lime into rounds a little more than ⅛” thick. Peel the ginger, then slice it into pieces a little more than ⅛” thick. You don’t need these pieces to be pretty, unless a nice garnish will make you feel better. In a medium saucepan, bring the Coke, lime slices, and ginger to a boil over high heat. (If you want to skip part of the next step, tie up the lime and ginger in a piece of cheesecloth.) Once the mixture reaches a boil, reduce the heat and continue to simmer for roughly 10 minutes. Keep a close eye on the simmer. You want to give the lime and ginger ample time to infuse the Coke, but you don’t want to cook it down to a syrup consistency. Once the mixture is slightly thickened, it’s probably ready. Remove the mixture from the heat. Using a mesh strainer that can take the hot liquid, strain the Coke into a large mug. If you saved any lime slices, float one on the top of the Coke. Allow to cool slightly, then enjoy! We hope your winter in Rock Hill will stay warm and well. Keep checking back for more recipes and community events.